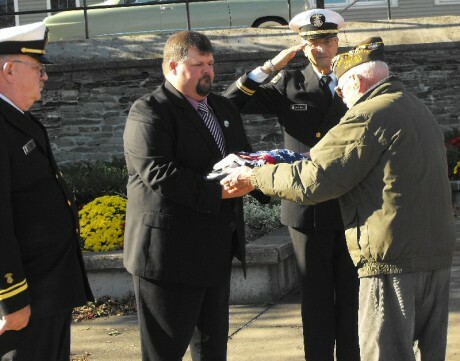 Oswego veteran Paul Riordan presents the flags to councilor Shawn Walker. Looking on are George Hoffman, left, and Fred Crisafulli. OSWEGO, NY – More than five dozen people, young and old, gathered in Veterans’ Memorial Park on Thursday. They stood among the flags and monuments like they always do – to honor their fallen comrades who gave the ultimate sacrifice to ensure the rest of us continue to live in a free nation. The park is reportedly the site of the first free-standing MIA – POW monument in the nation. After a brief prayer in honor of all veterans, especially those who have given the ultimate sacrifice in the defense of freedom, the flags at the center of the park were lowered. The Oswego City flag was first. It was solemnly folded. The Prisoners Of War flag was next. Then, the American flag was retired as well. The flags will be raised again next spring. Navy Sea Cadet Shyan Fisher assisted Oswego veteran Paul Riordan in folding the American flag. He then presented the flags to Shawn Walker. Walker, vice president of the Oswego Common Council, accepted the flags on behalf of the city. The temperature crept toward 50 degrees making it one of the nicer days on which the ceremony has been held. Congressman Bill Owens, an Air Force veteran, greeted the crowd. 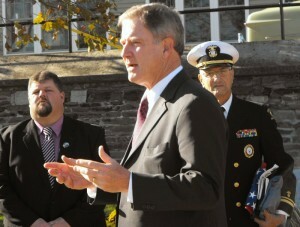 Congressman Bill Owens addresses the crowd at Veterans’ Memorial Park in Oswego on Thursday. In the background are Shawn Walker, vice president of the Oswego Common Council, at left, and Fred Crisafulli, Oswego Tourism Director. The other night he received an e-mail from his daughter. She told him that his six-year-old granddaughter wanted to know what time she could call her grandfather for information about his father, who served in World War II on a B-24 in England and flew raids over Germany. He went on to thank the veterans and those who support the veterans. Oswego City Councilor Connie Cosemento described Veterans’ Memorial Park as a learning tool. “It allows us to bring our children and our grandchildren here and let them ask questions” and learn about the city’s and the nation’s veterans, she said. Veterans Day commemorates the Armistice back in 1918, after World War I. It is celebrated on the 11th day of the 11th month at the 11th hour; that’s when the truce was declared, according to LTjg George Hoffman, USNSCC, of the U.S. Naval Sea Cadet Corp Truxtun DDG-103 Division in Oswego. Thursday marked the 92nd anniversary of that first observance, Hoffman, the day’s MC, added. In 1954, the holiday was changed to Veterans’ Day following World War II and the Korean War. Mayor William Cahill’s name has been added to the plaque at the entrance to the park, Hoffman said, adding the park was constructed during Cahill’s administration. “… I am the Unknown Soldier. And, maybe I died in vain. But, if I were alive and my country called – I’d do it all over again,” he concluded. VFW Post 2320 in Oswego will hold a sock hop Friday night. The hours will be from 7 p.m. to midnight. Participants are invited to come relive the fun of the 1950s and 1960s – a dress in the appropriate era attire. The U.S. Naval Sea Cadet Corp Truxtun DDG-103 Division will hold its monthly drill Saturday and Sunday at the McCrobie Building, 41 Lake St. The drill will be from 0700 (7 a.m.) Saturday until 1600 (4 p.m.) Sunday. Anyone interested in joining the Sea Cadets or obtaining information is encouraged to attend an open house Saturday at 9 a.m.